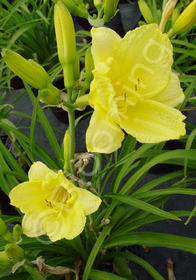 Clear lemon-yellow, lily-like flowers bloom non-stop from late May until frost! This superior and care-free selection is a favorite with designers. It makes an excellent long-blooming perennial for containers too!